I was driving to downtown St Louis the other day, in the snow and started day dreaming about wintery outfits involving pants. I checked my closet and realized that my pants inventory is dangerously low so I popped into 2 thrift stores and found some high waist pants. Along them is a pair of stirrup pants. I'm a child of the 90s so my mom bought me several pairs of these terrible things in all colors. I'm pretty sure that I had some red ones with a Christmas print turtle neck. I found this pair and didn't realize what they were till we were in the dressing room and I thought, "Oh, let's just try them on." So I did. I liked them and I bought them. When I shop alone, bad things happen. I don't have a girlfriend or my husband to say "Oh hell no!" so I make poor choices. However, it's always good to try new things and sometimes they turn out to be not so bad. This could be another classic bad fashion choice of mine but I've worn them in public a few times and no one has thrown rocks at me yet. You can either chop off the elastic or pin it up under the cuff and no one knows you're in a 1993 time warp under there. Also, check out my new favorite jacket that I thrifted! It's a modern jacket from Land's End or something like that. I'm pretty sure Dorothy from The Golden Girls would have worn something like this but whatever, I love it! Today's blog pictures by my little girl, Olivia- Such a wonderful helper! cute... You proved it pays to try new things. Fabulously fun ensemble! I really like the pattern mixing that you're rocking here - and I'll be chuckling all day now over the my own memories of 1990s stirrup pants (*shudders*). Darling! I hit up the Salvation Army at least twice a month (always on Saturdays, when clothing is $.69.) to find clothing. Recently I've been searching for pants as well. Living in West Michigan, skirts aren't always the most practical for me during the winter months. Love the blog, thanks for being an inspiration! I love your jacket. I need more plaid in my life. They don't look weird at all. The stirrup pants actually look kind of sporty instead of a flashback of the 90's. You did very well in coordinating it too, the jacket looks great! I also really love those red shoes. Give my complements to your sweet daughter, she took the pictures wonderfully. 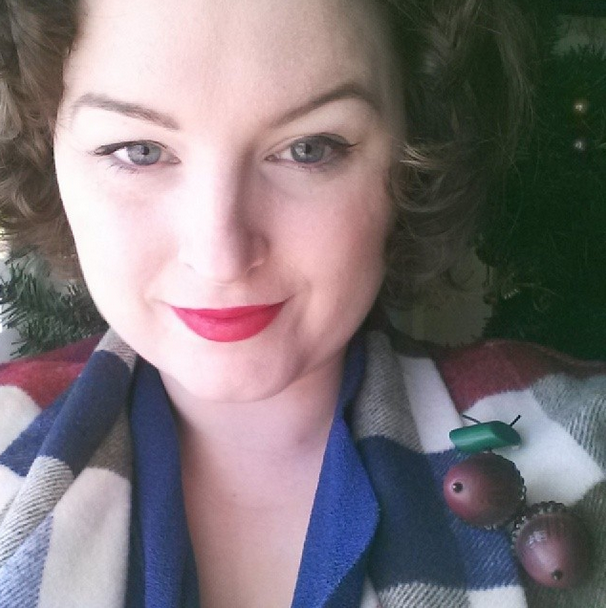 I love your little acorn brooch! Love it!! My favorite thing to do is buy some "mom" jeans from target, pair them with a couple vintage pieces.. and voila! No one is ever the wiser! ;) haha!